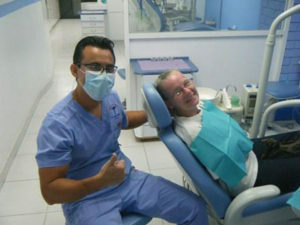 Home » Rocky Point Times » How Much Do Dentists Charge in Mexico? How Much Do Dentists Charge in Mexico? Medical and Dental procedures in the USA are notoriously expensive and many people have discovered Mexico as a professional alternative for a fraction of the price. While taking advantage of medical procedures and general medical practices in Mexico are a growing trend, the dental profession has been booming with those North of the border for several years. And, the trend continues to grow. So, saying that the majority of dentists in Mexico (and Rocky Point) have modern facilities, modern equipment, very comprehensive training, speak English, and take better care of their patients is good to know, what about the prices? Everyone has heard that the procedures are “cheaper”, but what exactly does that mean? Dentures are a perfect solution for a set of teeth that are completely damaged and need replacement. This treatment is the preferred for people who don’t want to go under an implant procedure. This is the most popular procedure for medical tourists. Implants can replace permanently from one tooth to an entire set of teeth. This treatment is one of the reasons why Mexico has become such a popular destination for dental tourism.